If you've read One Degree (2010), you know of John's focus on elegantly structured card magic, made stronger through small improvements that have massive impact. 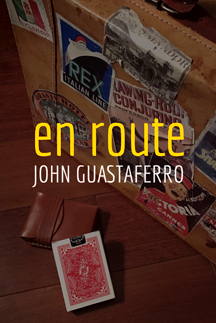 EN ROUTE is an 84-page book featuring ten new card effects. Each is described in lucid detail with more than 100 photos to accompany you during your exploration. He also sheds light on how they've developed over time and how they bring your audience along for a captivating ride. Beyond the routines, John draws from his decades of business and branding experience to offer several insightful essays to sharpen your perspective as a performer. Time to call “deck” support. A virus causes your deck to go from all backs...to all blanks...to printed faces. It makes a great visual opener and uses just one extra card. A direct in-the-hands Triumph routine where the deck straightens out in the participant's hands. A few seconds of impromptu preparation gets you far ahead. There are several one-degree touches throughout. After four cards are selected, the performer reads the minds of four participants—then finds each card. This streamlined version of John's popular "Multi-Mental" is perfect for strolling and brings the power of mind reading to settings with smaller audiences. A deck of cards and card box change places—then the signed selection is found inside the card box. It's a fun and offbeat way to open this set. After a participant traps her whisper inside the card box, the performer hears her thoughts, then makes her card materialize inside the box. This is a worker. It features a powerful premise and an engaging experience for your audience. Four Aces instantly change places with two boxed Jokers. With wonderful touches by Jack Carpenter and David Regal, magicians will enjoy how much magic you get out of just six cards and the card box. Two participants thoroughly cut and shuffle the deck, and together, find the four Aces...and you never touch the deck. With a beautiful idea from Dani DaOrtiz, this update to John's effect "Hands Off Aces" makes it stronger than ever. "Chip Off the Old Daley"
This mini routine is all about transpositions, using two poker chips and the four Aces. It's fun, engaging, and easily fits into any gambling theme. The Aces spread out in the deck to gather intel about a top secret card, and return back in a thrilling way. The selection makes a surprise appearance at the end. This routine combines an Ace production with a card revelation, and wraps it all in a "Mission Impossible" theme. Four pocketed Jacks instantly change places with Aces being held by the participant. This is a new version of John's effect "Quick Pocket," featuring a final fooling moment. It's a great closer, not only for this book, but for any routine.